During roughly the same time period, two astronomers created similar plots while investigating the relationships among the properties of stars, and today we refer to these plots as "Hertzsprung -Russell  Diagrams," or simply HR diagrams. Even though this is quite a simple two dimensional plot, over the course of the next few lessons, you will see exactly how powerful they are for uncovering a host of information on the nature of stars. In a true HR diagram, you would plot the effective temperature of a star on the X-axis and the luminosity of a star on the Y-axis. The quantities that are easiest to measure, though, are color and magnitude, so most observers plot color on the X-axis and magnitude on the Y-axis and refer to the diagram as a "Color-Magnitude diagram" or "CMD" rather than an HR diagram. Figure 4.6: Schematic plot of an H-R diagram with color, temperature, and spectral class all plotted on the x-axis, and luminosity and absolute magnitude plotted on the y-axis. Stars are color coded based on their real observed colors. 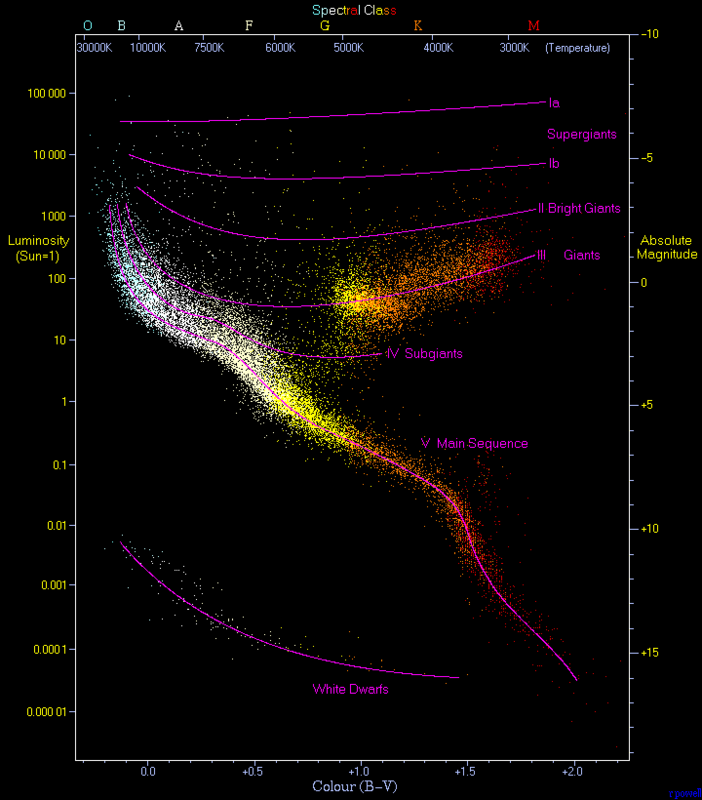 Lines are overplotted showing luminosity classes, including dwarfs, giants, and supergiants. L = 4π R 2 σ T 4 This equation is not rendering properly due to an incompatible browser. See Technical Requirements in the Orientation for a list of compatible browsers. If we assume that all stars are roughly the same size—that is, assume that R is approximately a constant, then the equation above tells us that the hotter a star is—the brighter it will be, and since L (luminosity) depends on T4 (temperature), small differences in T will cause large differences in L. We should, therefore, expect that hot, blue stars will be much brighter than cool, red stars. The upper left corner of an HR diagram includes the hot, bright, blue stars. The coolest stars are much fainter than the hot stars, and they lie at the lower right. The band connecting the hot, bright stars at the upper left to the cool, faint stars at the lower right is called the Main Sequence. Most stars on the Main Sequence (like the Sun, which is a G star), are referred to as dwarfs, but the hottest Main Sequence stars (O stars) are sometimes referred to as giants or supergiants. You should also notice that there are stars found off the Main Sequence in the upper right and the lower left of most of these diagrams. The objects in the upper right have the same temperature as M dwarf stars, but they are much brighter. Again, consider the equation above. If two stars have the same T, the only way that one can be brighter than the other is if one has a larger R. Thus, the stars in the upper right are much larger than those directly below them on the Main Sequence. Since these are red stars, we refer to them as Red Giants. Using this same logic, we can estimate the size of the stars in the lower left of the HR diagram. They have the same temperature as O, B, or A stars, but are much less luminous. Thus, these stars must be much smaller than the stars directly above them on the Main Sequence. The stars in this category are called White Dwarfs. We will spend much more time investigating the different types of stars and their location in the HR diagram in the next lesson.